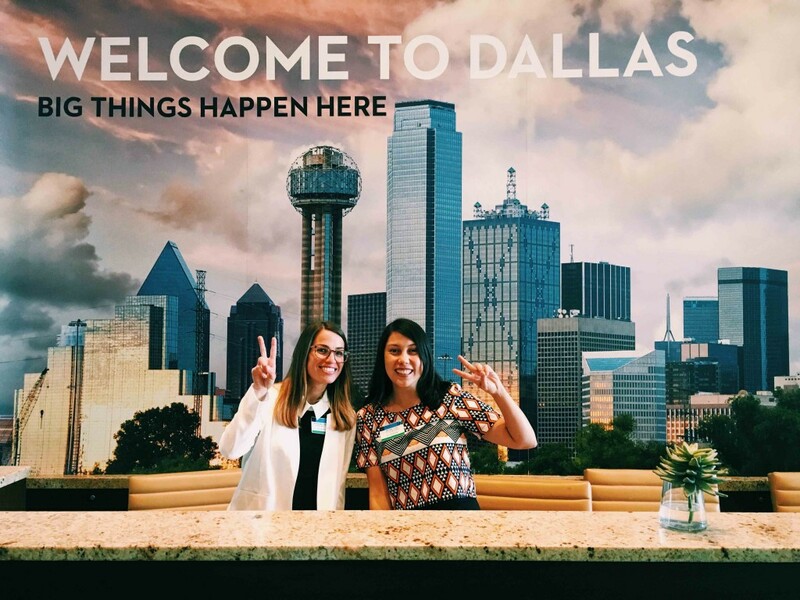 Founders Katie and Mel are just wrapping up their time in Texas – it’s worth mentioning this is our first time seeing one another face to face in nearly 3 years! – after an exciting week attending the World Travel and Tourism (WTTC) Global Summit, representing Kinyei (Kinyei Cafe and Soksabike) as a finalist for Tourism for Tomorrow Awards. The WTTC Summit, held in Dallas this year, covered two full days of speakers, panels, presentations, and networking with an all star group of influential players in global tourism including major hoteliers, airlines, tour service providers as well as government leaders, economists and academics. While the WTTC Summit mostly represented the interests of these major tourism players, the Tourism for Tomorrow finalists represented lean, fresh and innovative approaches to tourism and sustainability. 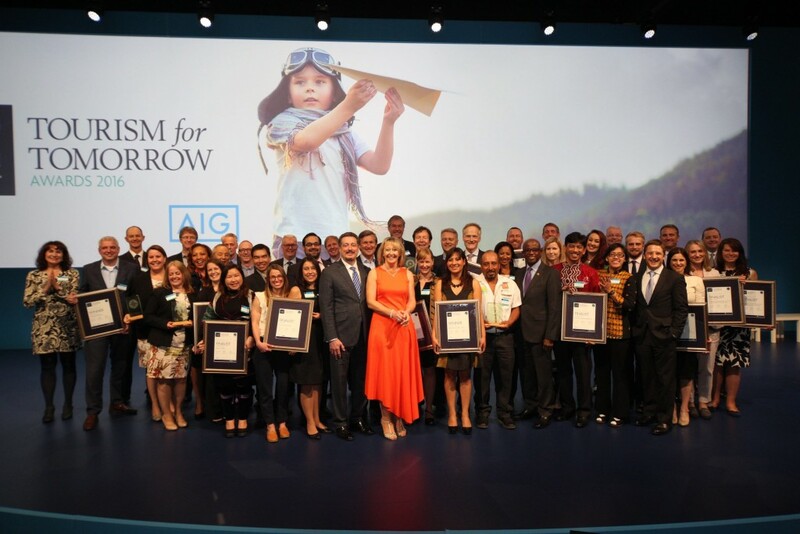 Kinyei was acknowledged in the top three sustainable tourism organizations for doing outstanding work with people and communities amongst a group of 15 finalists representing 14 countries in the 2016 Tourism for Tomorrow Awards supported by AIG. Though Kinyei didn’t walk away with the award, we were thrilled to be among such impressive company – Jus’ Sail, a St. Lucia based vocational training operator, and Youth Career Initiative (YCI), a UK based hotel and hospitality training partnership both do excellent work towards improving youth employment outcomes around the globe. Have a read about YCI, the winners in the category here. It was a jam packed few days that we could go on for hours about but instead we’ve tried to distill a few key insights we walked away with for you here. Leadership and innovation coming from the little guys – it seems the movers and shakers of new ideas were all the small operators, largely those of us involved in the Tourism for Tomorrow awards. It strikes us how important it is for us to have strong linkages between the big guys and the emerging players for the industry and for the future of the planet. We shared a bus ride with the CEO of Lonely Planet, dined at a table with the former CEO of Disney, and current CEO of a major international cruise liner, but the story we told about the Kinyei and Soskabike teams was always the biggest crowd pleaser. We met our tribe at the Tourism for Tomorrow awards (we spoke the same language and felt part of a broader community) – they are exciting and operating in amazing locations and we want to visit them all! We already know that two of the sailing initiatives will be doing a staff exchange, and we’ve got our own collaborations cooking…so stay tuned! Well, we’ve got an awesomely expanded community, access to cool new tools for impact measurement, and will continue to ramp up our involvement in more ASEAN region sustainable tourism groups and events. If you’re in the sustainable tourism, social enterprise or a related field we would absolutely love for you to get in touch and share with us what you’re working on. That’s what this collective impact thing’s all about! Our Kinyei family is growing! Our family is growing! 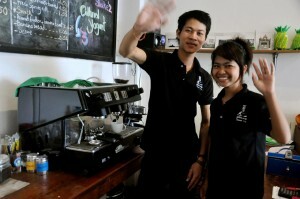 @Feel Good Cafe and Coffee Roasters and @Kinyei are new partners and co-owners of @Kinyei Cafe in Battambang. Same wonderful Kinyei Cafe staff and excellent coffee, with some new food on the menu and a new look! Come and sample our new goodies and see our fresh new look for our reopening this month (November). It is with great anticipation that we share the news that Kinyei Cafe has formalized our partnership with our roaster, Feel Good Group. As of October 1st of this year, Feel Good became the newest majority owner of the cafe, and the operating partner on st. 1 ½ . Feel Good’s expertise in hospitality and bean roasting combined with the Kinyei team’s reputation for excellence in espresso making and dedication to employee development positions both Kinyei and Feel Good for continued success and market leadership. This transition also signifies something else to get excited about; the beginning of local ownership, a milestone that we’ve been working towards since we launched Kinyei Cafe! We’re thrilled that Yong (Chhouert Leng), our tireless manager, will join the ranks of the owners. We wanted to update you on these new developments now because this month marks the soft opening of the new space, with some amazing aesthetic improvements and menu additions. But let’s back up, we want to give you the full story, and answer some of the FAQs you might have. 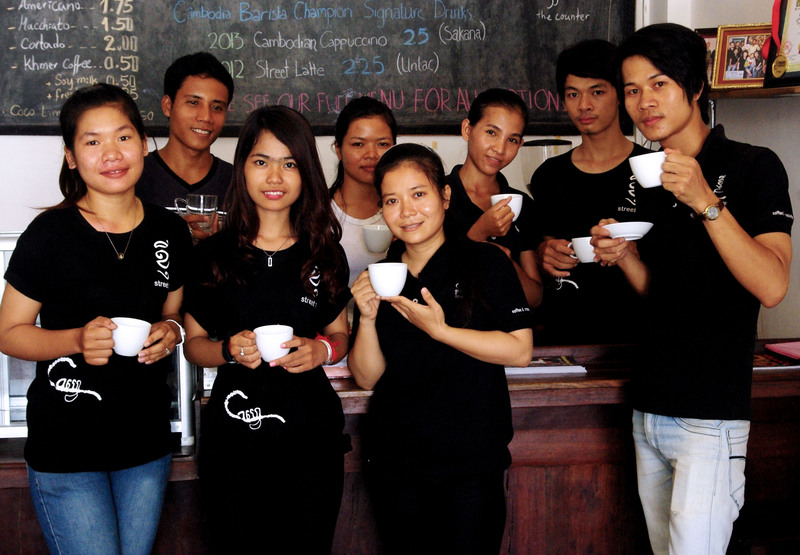 Kinyei met Feel Good a few years back at the 2013 Cambodian National Barista Competition in Phnom Penh via Sakana Long and Untac Nem, our award winning baristas who forged the relationships. The Feel Good connection blossomed as Kinyei began to buy Feel Good roasted beans, and seek advice from Marc and Jose on small scale renovations and management strategies. Through these collaborations, the Feel Good and Kinyei teams became acquainted, and linked. This year, the desire on both ends to formalize a relationship propelled Kinyei and Feel Good to start discussions over what a partnership might look like. Both teams prioritized sustainability, growth and local ownership in order to maximize the shared value. After growing their two cafes and roasting facility in Phnom Penh, Jose and Marc felt strongly about Battambang as their next move. Mel and Katie led consultations with Yong and the team, and collectively knew a Feel Good merge could mean big things for Kinyei Cafe. We began discussions in May and through an impressive skype effort (where we relied on Cameron Neil, Hian Chan and Ben Hopper), with Katie in Cambodia in June and July, we reached an agreement in August. Mel came through to Battambang to arrange the transition in August, and here we are in November with the new Cafe ready to launch! Will the name of the Cafe change? No, Kinyei Cafe will remain Kinyei Cafe! Feel Good understands the power of Kinyei’s brand in Battambang and throughout Cambodia and will operate the cafe under that name. After all,our name is a core part of the identity that the team has cultivated over the years! How will it affect Soksabike? And what does it mean for Kinyei generally? Kinyei International will retain a stake in Kinyei Cafe, and as full owners of Soksabike, Kinyei International will ensure that the relationship between the sibling businesses remains symbiotic and dynamic! Finally, we want to thank you for being a part of the Kinyei family, and for your involvement over the years which ultimately ensured this huge victory for Kinyei, and for believing in the small, social enterprise models that make small but significant impacts in local communities. We couldn’t have done this without the support, mentorship, and generosity of the Kinyei network. We hope if you’re around you will come by to celebrate! 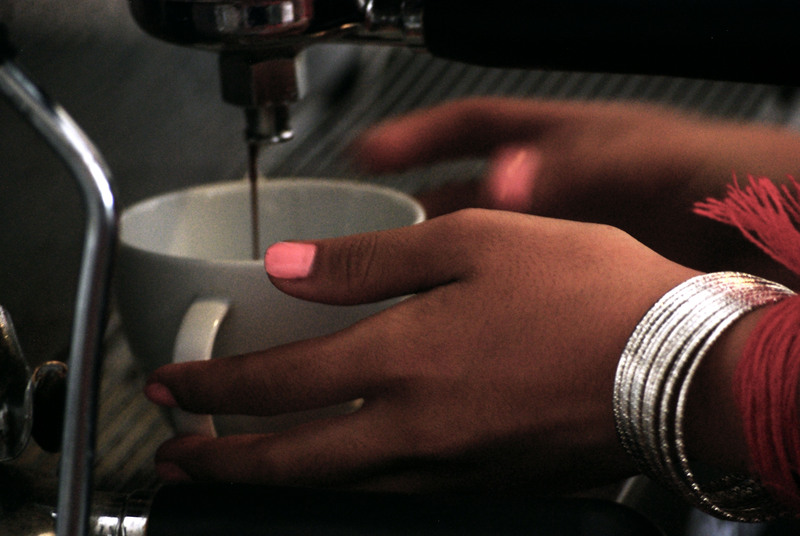 And do stay tuned for more exciting news on the new Kinyei Cafe! 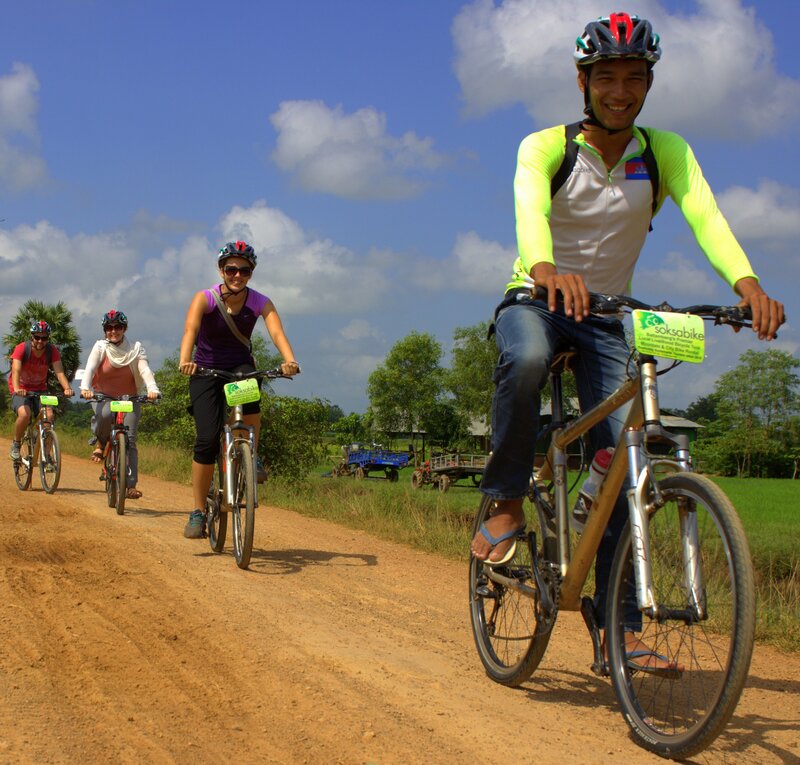 As Kinyei turns five years old, what better way to celebrate how far we’ve come on our journey to create meaningful community tourism projects in Battambang than to be recognized as a leader in the sustainability and the responsible tourism industry. We are over the moon to share with our friends, long-time supporters, customers and community that Kinyei has been named the winner of the Most Inspiring Responsible Tourism Initiative category by Wild Asia. Kinyei is an initiative aimed at creating sustainable social change through youth focused social enterprises. 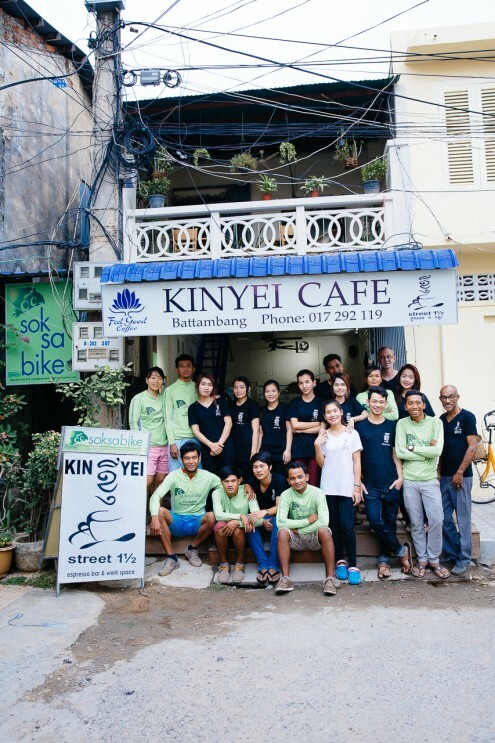 Soksabike Tours and Kinyei Cafe, Kinyei’s key enterprises, are sibling businesses in Battambang, Cambodia with the aim of providing meaningful training in hospitality and responsible tourism practices. We’re excited to receive the award for both of these tremendous efforts, but we also wanted to give a shout out to the other finalists in our category EXO Foundation Cambodia and CBT Vietnam, two commendable responsible tourism initiatives worth visit if you have the chance! Our trusty Soksabike Manager, Yurie Nagashima, accepted the award on behalf of Kinyei last week in Bangalore, India. 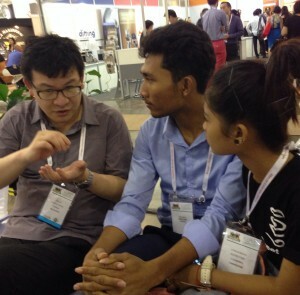 It was also an opportunity to showcase Kinyei’s mission, and Battambang’s unique potential on a world stage. 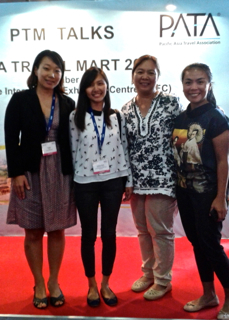 Yurie was also asked to speak alongside Amy McLoughlin of Wild Asia on Social Innovation in Responsible Tourism. A bit about the Awards: Wild Asia is the first Asia-focused, responsible tourism technical and strategic support partner working to sustainably enhance tourism sectors across South and Southeast Asia. Each year, Wild Asia chooses winners across five categories to showcase as leaders in the industry. Kinyei is joining the ranks of some of the most impressive tourism initiatives out there including Scuba Junkie, a marine conservation partnership in Malaysia, viavia Jogja, an arts, culture, gastronomy and adventure tour operator in Indonesia, and Lisu Lodge, a natural heritage tourism operation in Thailand. We are honored to join a community of conscientious tourism operators. A bit about the specifics of Kinyei’s Award: As the recipient of the Most Inspiring Responsible Tourism Initiative award, we are delighted to be recognized as a champion for grassroots initiatives for responsible tourism in Battambang and in Cambodia. Since Kinyei was conceived of, we’ve been motivated by inclusivity, community narratives, and the power of collaboration. Throughout our projects, from the early days co-creating digital communications solutions with local NGOs through the Profile Project, to helping launch Sammaki a local arts community gallery, to our social impact evaluations with our Soksabike Tour community partners, to sending Sakana off to Singapore to represent Cambodia in the regional barista competition, we have never done anything alone. Our recognition symbolizes the admirable efforts of all of our collaborators and supporters over the years. So, thanks to all of you! We asked Yurie a few questions about her take on the awards, and, en route to India, she was able to give us some grains of wisdom – we’ll have them up for you to see so check back soon! In the meantime, you can read more in a recent Khmer Times write up about the projects. And for now we just want to say thank you for supporting the Kinyei mission! We couldn’t have done this without the efforts of so many of you. And if you haven’t stopped by for a cycle tour or an award winning cappuccino yet, we’d love to welcome you in! 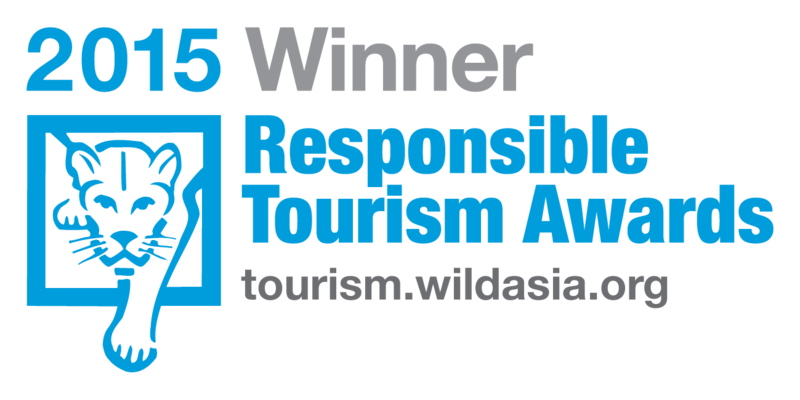 We won the Wild Asia Responsible Tourism Award! Kinyei, which operates Soksabike Tours and Kinyei Cafe, won the Wild Asia Responsible Tourism Award 2015 under the Most Inspiring Responsible Tourism Initiative category! We are very excited to have received this recognition for our effort in promoting sustainable tourism practices. Please have a look at this Soksabike’s page on some of the examples of our responsible tourism practices. 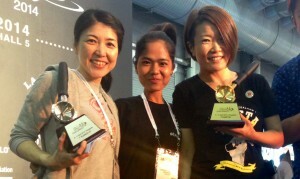 Kinyei cafe superstar Sakana Long recently competed against the region’s best baristas at the FHA 2014 Barista Challenge in Singapore’s Expo Center between April 8 -11. Asia Pacific’s top baristas were invited to the event with 13 countries represented, including Cambodia, which sent along Sakana. 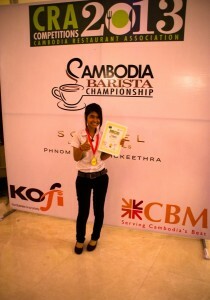 It was Kinyei’s first international competition, and followed the cafe’s second national win in Phnom Penh at the CRA Cambodia Barista Championships. 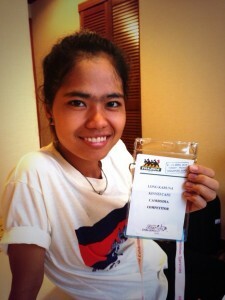 The 2012 Cambodia Barista Championships winner and Sakana’s coach, Untac Nem, accompanied Sakana over on her first ever international flight, and Kinyei’s co-founder Melina Chan met them in Singapore to help with logistics and cheerleading. 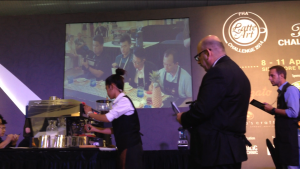 This event was truly at another level – most competitors owned their own roasteries and cafes. The competition itself is a 15 minute performance where 12 coffees need to be made and presented to the judges – 4 espressos, 4 cappuccinos and 4 of the competitor’s signature drink, based on the World Barista Championships format. With her signature drink, Sakana wanted to showcase the local blend she had selected – from Chaing Mai, Luang Prabang and Mondulkiri – and paired it with pineapple syrup and honey both sourced from Cambodia (she brought them in her luggage across from Cambodia to Singapore!). When it was finally Sakana’s turn to take the stage she was pretty nervous and this had immediate repercussions – by the end of her preparation time she hadn’t quite got the grind right, and had to continue adjusting once her competition time started. With an unfamiliar grinder and mounting pressure, she was still working at it 5 minutes into her 15 minute performance. Minutes went by and she was still under- and over-shooting the adjustment. It must have been devastating, but she did not give up despite the ticking clock and, no doubt, burnt fingers from all the espresso cup cleaning! Finally at 10 minutes Sakana hit a good pour and, instantly hitting form, used her remaining time to complete her performance, serving and presenting her signature drink in the nick of time. It was an amazing recovery from what must have felt like an impossible situation. Sakana shares the stage with four sensory judges, two technical judges, a head judge and a shadow judge as well as two timekeepers. The team was short some of the necessary equipment (each barista is responsible for bringing their own cups, saucers, jugs, everything) on arrival, so the first 12 hours were spent racing around Singapore. Neither Sakana nor Untac had ever really used public transport before and navigating the MRT proved to be a fun challenge for both of them. In the end we found everything we needed thanks to our very generous new friends at Bettr Barista. New Zealand took out the title, while Japan came 2nd and Singapore 3rd. At the end of the day, Sakana was obviously disappointed; she wanted to be able to put her best out there and see how it stacked up in the international arena. But it took an amazing strength of character to work through a problem like that in an utterly overwhelming setting. Everyone was incredibly proud of her, and the whole team who worked to get her there. Sak was very proud of her own accomplishments too. 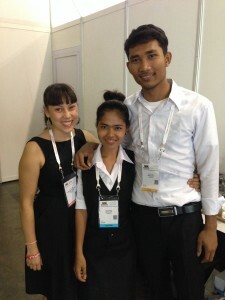 And with any luck, it won’t be the last time we see Kinyei at an international barista competition. Thanks to everyone out there for all of your support, of course without which none of this would have been possible. Special thanks to the Jasper Coffee team for their generosity, support and guidance. The opportunities the team can create and access themselves now are definitely beyond anything they could have once imagined and we feel very lucky to have been able to share this journey. Kinyei has been nominated for the 2014 Start Some Good Impact Awards! We’re really excited to be considered alongside SSG’s other incredible finalists (who are all absolutely worth checking out). Importantly however, the awards work on a voting system, which means we need your help to win! Please join the Kinyei votesquad by going to http://bit.ly/impact14, Like the page and vote for Kinyei! 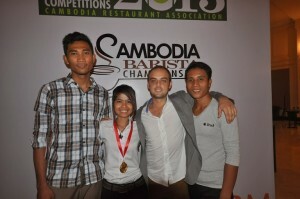 We’re ecstatic to share the news that Sakana Long has just been named the 2013 Cambodian Barista Champion this past weekend at the Sofitel Phnom Penh! Congratulations, Sak! Sakana was the youngest and only provincial entrant in the competition dominated by participants from Phnom Penh, and was up against competitors from international coffee chains such as Gloria Jeans (3rd place) and Costa Coffee (2nd place). 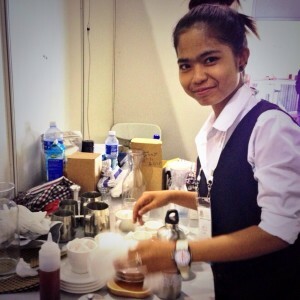 Sakana carries on the Barista Champion title for Kinyei in 2013 after Untac’s win in 2012. We are so proud of Sak and the entire team for all of their hard work in preparing for the competition, and in their dedication to great coffee making! “Yesterday when I get champion, I’m crying I’m so happy”, Sakana’s responded about her win on Monday. Living with her four siblings and grandmother in Slaket Village just on the outskirts of Battambang city, she joined Kinyei Cafe in December 2010 to earn a wage to support her brother completing high school whilst gaining some skills of her own. When asked what she’d like to do next, she said she wants to learn how to taste coffee, fix the machine, continue to improve her barista skills and understand everything about how the coffee machine works. She also wants to learn about the picking, fermenting, roasting, and cupping processes. And another bit of fantastic news – Untac, Kinyei’s enigmatic barista, Soksabike tourguide and first place winner of last year’s national competition went on to compete last month and place in the regional barista championships in Kuala Lumpur, Malaysia. Untac was invited to be a technical judge on the panel for the 2013 Cambodia competition. How did you feel while competing? How did you feel when you won, when they announced your name? “And the second time, her performance was just so smooth. If you look at the performance, I just can’t believe how she does that. Every movement is confident and she knows what to do and she’s cleaning as she goes. And she says she’s not nervous at all” Untac reported. Sakana has already received some glowing feedback from the head judge about her capacity to learn and improve between the debriefing of the first round and her performance in the finals. “She took on board all the advice given to her to better her performance and raised the bar for Cambodia as a whole” says Ross Bright, World Barista Championship judge 2007-2008, current Speciality Coffee Association of Europe National Coordinator and Master Roaster for Spinelli Coffee Singapore . http://sfy.co/bSSi – Check out our storify – a moment-by-moment account of the event told through tweets and images as it was unfolding! We’re over the moon for Sakana and the team. Stay tuned for updates including the next steps for Sakana and Untac, representing the finest in coffee in all of Cambodia!